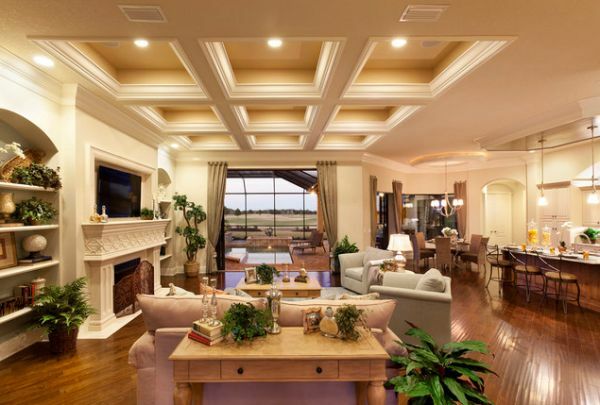 Have you planned to incorporate modern ceilings into your dream home? Majority of us are no longer inclined towards conventional flat ceilings since they minimize the chances for us to decorate the interior of our house. On the contrary, the contemporary ceilings can set the tone for entire space and provide you plentiful décor opportunities. An artfully designed specialty ceiling can let you absolutely satisfy the artist that lies within you. This decorative technique is used for enhancing the overall looks of rooms. The crown molding is applied at the place where a wall meets the ceiling. These moldings are made of plaster or wood and have the ability to gracefully flare out top edge of your room. Usually, people make use of molding for capping walls and pillars. These interior and exterior cornices greatly enhance the outlook of your home. Normally the moldings are used as one single piece but at some places, they may also be used as two, three or sometimes more pieces. This kind of ceiling is most common these days in the contemporary homes. The tray ceiling adds a touch of class and an artistic element to the room. A tray ceiling usually begins horizontally at the intersection of walls. It can be cut vertically or angled and is built upwards in a way that it looks like a tray on the roof. You can choose to get it made in a ‘dropped’ or ‘raised’ form depending upon the height of ceiling and many other elements. The depth of tray is usually six inches but it can be deeper as per client’s requirements. You can use this type of ceiling for your drawing room, dining room or even for the bedroom suiting your preference. The domed ceilings are mostly installed in grand homes and mansions. This type of ceiling usually gives the impression of large circular domes of government buildings as well as some ancient churches. The domed ceiling can be opaque and artfully painted. In contrast, it can also be made of fiber glass or stained glass for the natural light to pass through and add a better dimension to the ceiling. If you are planning to renovate your ancient home into a brand new modern one, you may not even need to cover the older ceiling that comprises visible beams. With a modern exposed beam ceiling, you can give rustic feeling to your home. The exposed beams may seem too odd to you in your home before the revamping process but after having the decorative job done, they would certainly feel unique and much elegant than you had ever imagined them to be. If you want to give a unique and purely artistic touch to your arched doorways and hallways then a cove ceiling can certainly be the best choice for you. This type of ceiling has a rounded concave surface and transforms the ordinary doorways and hallways into splendid areas, adding a lot to the overall architecture of your home. It is a tough task to create perfect curved ceiling hence requires you hiring the services of a highly experienced interior designer in Pakistan. For a perfect ceiling to turn your house into a home of your dreams, you should acquire the services of a globally recognized architectural and designing firm such as Amer Adnan Associates, who can flawlessly transform your dreams into reality.